My school, Simmons University, offers a “Toxic Consumables” course as an elective to first-year students. The class covers everyday exposure to toxic chemicals through consumer and personal care products. It also addresses how exposure to toxic chemicals through personal care products disproportionately impacts women of color. However, if students don’t take the class they may never learn about this important topic and how to address it. That’s why Helen Drinan, Simmons University president, recently invited state Senator Cynthia Stone Creem as well as Simmons chemistry professor Rich Gurney, Silent Spring scientist, Robin Dodson, and WGBH Boston Public Radio hosts Jim Baudy and Margery Eagan, to speak at the “Human Health and Our Environment” presentation. Simmons students and faculty gathered to learn about what is being done to address the prevalence of toxic chemicals in our city, state, and school. Since 2012, Senator Creem, the sponsor of a bill in the Massachusetts Senate to ban toxic flame retardants, has been working to ban certain flame retardants in Massachusetts. Representative Marjorie Decker is the sponsor of an identical bill in the House. Students who attended the event learned that toxic flame retardants do not actually prevent household items from catching fire, and have been linked to certain types of cancer and developmental delays in children. Senator Creem’s bill would ban the use of some chemical flame retardants in household goods and would make Massachusetts the first state to ban chemical flame retardants in children’s car seats and certain parts of adult mattresses. After passing through the Massachusetts House and Senate late last year, Creem’s flame retardant bill died on the desk of Governor Charlie Baker (he had 10 days to sign it, but he didn’t, which counts as a “pocket veto”). This means that Massachusetts residents will continue to face exposure to toxic chemicals. 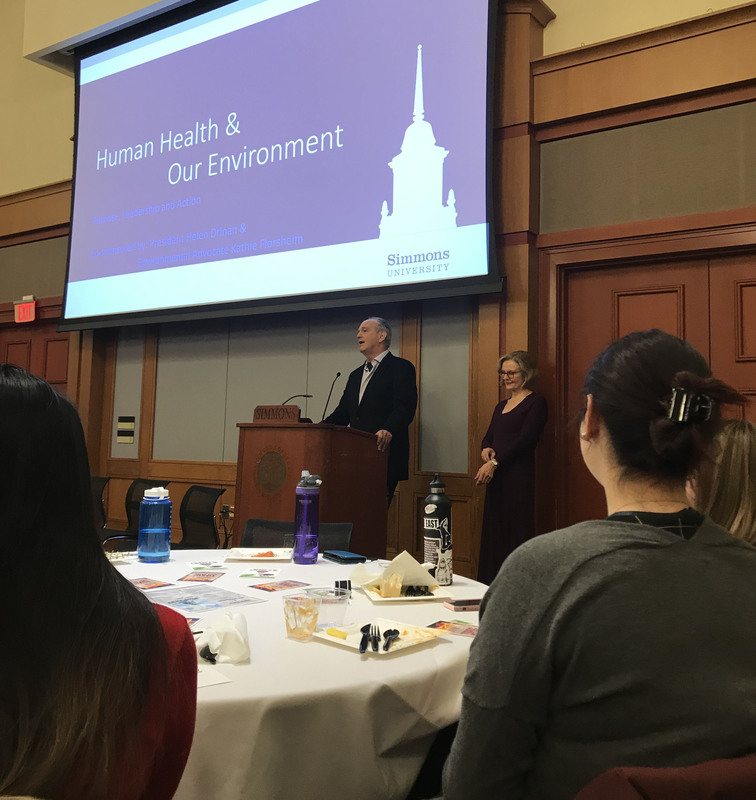 “It was disheartening to learn that even with the clear links between [flame retardants] and cancer, legislation trying to ban them is still having difficulties being passed,” said Celine Breton, a sophomore Simmons student who attended the event. The presentation also addressed the issue of toxic chemicals used in personal care products such as make-up, soaps, and lotions. Professor Gurney told the audience that 70% of lipsticks currently on the market contain lead as well as other dangerous toxins. He also discussed the toxicity of products targeted specifically at women of color such as skin-lighteners and hair-straightening treatments. As students at a women-centered college, these statistics resonated with my classmates and me. Because of the mass of products marketed specifically toward young women, we’re at particular risk for exposure to toxic chemicals through personal care products. Following the discussion, other students wanted to know how they could contribute to the fight to remove toxic chemicals from our everyday lives. In response, Senator Creem urged students to get involved in proceedings for the re-filed flame retardants bill.